Who doesn't love a good dog! Especially an under-dog! 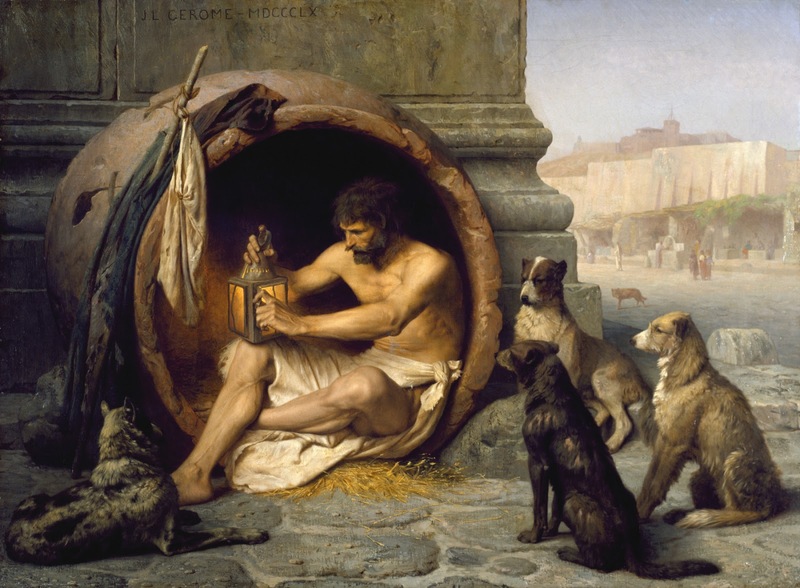 The greatest dog of all time was Diogenes. He lived in a barrel. He pleasured himself in public. He only wore a tunic. And he was called a dog. The name Cynic comes from ancient Greece, meaning 'dog-like'. That is the burning question and Epictetus reveals the answer. Epictetus admired Diogenes and often used Diogenes' as a good example of Stoic behavior. Epictetus was quick to point out that wearing nothing but a tunic, sleeping on the ground, not shaving, begging - all these behaviors - do not make one a Cynic. It goes deeper. Epictetus begins to explain why Diogenes acted the way he did; and in so doing, he teaches us Stoicism too. Whereas some will hide behind walls to indulge in pleasure, Diogenes, other the other hand, intends to put as little between him and the rest of the world. This is extreme transparency. There is no shame, fear, anxiety. He bares (and bears) all. The Cynic man is "the man of the open air." The only medium, in the Cynic's art, is his mind - nothing else. The start of the Cynic's duty is to train the mind; and so it is with Stoicism too. 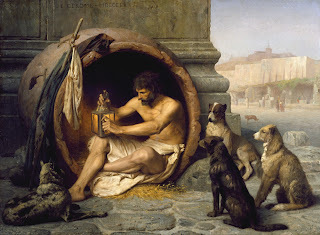 Diogenes contrasted with those who sought contentment and happiness in food, women, possessions or fame. He further contrasted with people who would be upset and angry when they did not get what they wished or when things did not go their way. While others sought the thrills of watching athletes compete, Diogenes, who was ill with fever, would yell at them as they passed, "Idiots, where are you going in such a hurry? You are going a great distance to see those damned athletes complete; why not stop a bit to see a man do combat with illness?" (verse 59). Equal to his fit body, should be his wits and sharpness, "otherwise he's just a boring windbag" (verse 90). Lastly, his endurance to physical and verbal abuse mush be unmatched. Epictetus uses the example of a block of wood, describing someone who can endure "insults or hits" (verse 100); whereas Marcus Aurelius uses the "rocky headland" as an example of unwavering endurance to brutality (see Meditations Book 4 Chapter 49). In summary, Epictetus attempted to describe, to his students, the Herculean effort it would require to embrace the Cynic life. He even begged them to "take some time to judge [their] aptitude" for becoming a Cynic. It is not for the faint in heart, rather, it is all out war. Epictetus Discourses Book 4 Chapter 1 - FREEDOM!